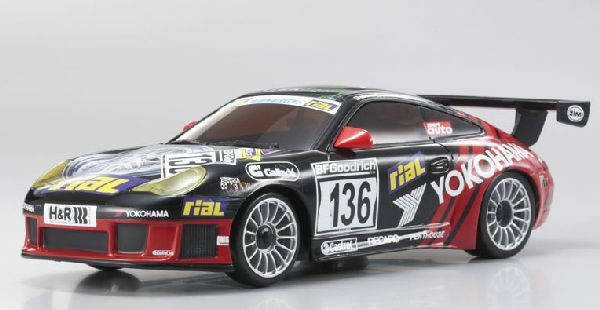 This is the KY32702ADB MR03N-RM CCS Porsche 911 GT3 R from Kyosho. The new 996 GT3 RS continues the tradition of being an evocative symbol of Porsche racing technology. As a road-going race car, the standard RS offers pure sports performance in every respect. The engine, transmission, body and chassis have all been refined for competition use. All extraneous weight has been stripped out of the car, the result cutting down approximately 50kg when compared with the 911 GT3 Clubsport. Expansion Connectors - The expansion connector allows optional gyro, light unit and I.C.S. interface to be connected and used. Please check back later, pricing and availability is always being updated. Additional information will be amended when it becomes available. We apologize for the inconvenience. Thank you! Por favor, vuelva más tarde, los precios y la disponibilidad se actualiza constantemente. Información adicional se modificará cuando esté disponible. Pedimos disculpas por las molestias. Gracias.